Sometimes when I come home from work, I get too lazy and tired to run to the store to buy things to cook. Since I try not to eat out too often, I look in my refrigerator/freezer and pantry and create a quick dish with what’s available. As long as there is some protein and vegetables, I could make some stir fry in less than 30 minutes. On this particular day, I had a bunch of left over uncooked deveined shrimp from a dinner last night, a bunch of vegetables (bell peppers, cherry tomatoes, celery) from a Veggie Platter and pineapple from a fruit platter I made last weekend. I had several options for sauces, but decided to use Sweet and Sour sauce since I think the red color of the sauce and the bright colors of the vegetables will make a vibrant and colorful dish. It is always nice to eat food when it is pleasing to the eyes, right? When Wok is hot, add garlic and stir quickly then add the bell peppers, celery, and onion and a couple tablespoon of the Sweet and Sour sauce mixture and stir fry for about 1-2 minutes. 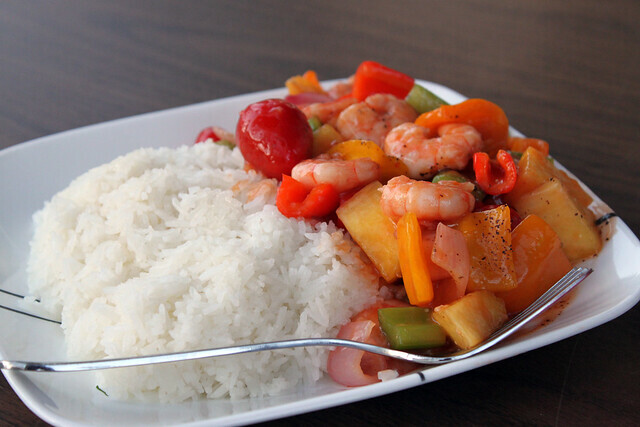 Add shrimp and the rest of the Sweet and Sour sauce and cook for another 1-2 minutes or until shrimp is cook. You can add some salt here if you want. Turn of the heat and add pineapple and cherry tomatoes and combine everything until the ingredients are covered with sauce. 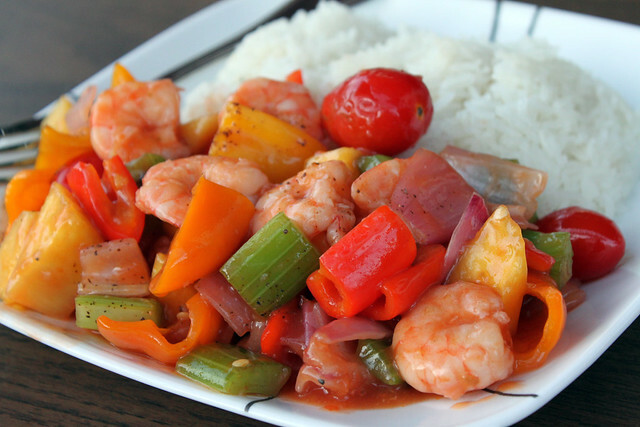 Serve Sweet and Sour Shrimp over Rice. You can sprinkle some crushed black pepper over the Sweet and Sour Shrimp and put some cilantro for garnish. Tip: Stir Frying is a quick process. Some vegetables take longer to cook than others. I usually cut all my vegetables in advance and put it all on a plate and add the vegetables at different times to the stir fry so I don’t overcook any of the vegetables or fruit. Also the great thing about stir fry is you can add whatever vegetables you have available!